The Green Phone Booth: Oh Christmas Tree, Oh Christmas. Should you be real or plastic? Oh Christmas Tree, Oh Christmas. Should you be real or plastic? Paper or plastic? An easy question for a greenie to answer. Neither. You bring your own bags. Real or artificial? Umm.... umm... You cannot reuse a real tree, so essentially it is disposable. Disposable = bad. Artificial trees can be used over and over again for years, but they are shipped from so far away. Local = good. Scratching head. Umm... What if the farmer used pesticides to grow the real tree? Pesticides = bad. But, artificial trees are made of PVC. PVC, that is a bad plastic that never goes away. Plastic = bad. Biting nails. Umm... I could compost the real tree. But, I would not have to deal with needles falling on artificial tree. No tree? Ugh! I give up! It is a decision many greenies struggle with. We took the same approach to the "paper or plastic" question when it came to answering the Christmas tree conundrum. Real or artificial? Neither. We chose aluminum. Okay, technically it is artificial. But, not the PVC-lead-laden-shipped-from-China artificial version you normally think of. Unlike the aforementioned "tree", this one is recyclable. Popular in the late '50s to mid '60s, aluminum trees are comprised of a wood pole drilled with angled holes to support aluminum branches that feature foil needles. They were typically lit from below by a freestanding color wheel. I would like to say that it was our good green conscience that led us to the purchase of our aluminum tree, but I must admit that our bizarre fondness for a decade that we never even experienced had more to do with it. 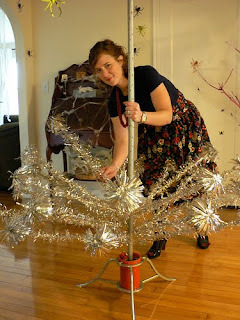 It took many internet searches and several failed eBay auctions for an aluminum tree to appear in our home. They are still being manufactured. You can purchase a new aluminum tree here, here, and here. Be prepared to lose some limbs - like an arm and a leg. You can even get an energy-efficient LED color wheel for your shiny new tree. If you truly want to be green, go second-hand and search out a vintage tree like we did - ours came from eBay. Although this was the greener route, it certainly did not save us any green. Who knew there were crazy Christmas tree collectors out there that will drive the price of an aluminum tree as high as the Christmas star? I will have to recycle a lot of aluminum cans to recoup the cost of this one! I suggest you start with local thrift stores, rummage sales, craigslist, neighbor's attics, what-have-you or, start saving now to buy one off eBay next year. If you want the convenience of an artificial tree, but struggle with the guilt of adding a huge hunk of plastic to the landfill, then this may be the option for you. Assembly is pretty straight forward. You start with the longest branches at the bottom and work your way to the top, inserting branches into the angled holes as you go. You may want to wear gloves as your hands get very dirty from the aluminum. Ours arrived in October, hence the spiders in the background. The first assembly took a while, as I was unsure of the angle of the holes. I am hoping with practice the time will decrease in future years. If your tree has poms on the branch ends, like this one, and was stored with a protective cap or wrap, then it will take a day or two for the poms to relax. You will need to take care when storing your tree branches. The foil needles become easy tangled and entwined with each other, causing needles to fall off when pulling branches apart. Yes, that is why I requested 145 wrapping paper/paper towel tubes on Facebook. I think cardboard tubes will be the perfect storage solution. Once assembled, no need to water, just decorate. A word of caution: You should not string lights on an aluminum tree. The aluminum could cause a short in the wire, i.e. house fire! This is why they were illuminated with a color wheel. On the subject of color wheels, you must take note of the size. Not all color wheels are created equal. Smaller ones illuminate smaller trees. If you have a large tree, you are going to need a large wheel. One that you can adjust the beam on is also beneficial. And, the weirder the wheel, the more it is going to cost. Like the tree, these are also highly collectible. One last piece of advice, the branches will not support heavy ornaments. The trees are pretty undecorated, but if you choose to, pick light-weight ornaments such as glass balls. Oh! And, assemble the tree in its final display location. Attempting to move the tree from room to room produces disastrous results! Ever try finding a needle in a haystack? Locating the one hole for the last branch that fell off is about the same. Trust me. When choosing your tree for this year, there are many things to consider. Wikipedia gives a good history of the Christmas tree along with the various types and their environmental concerns. Just to make life more difficult I am throwing one more option out there: the aluminum Christmas tree. 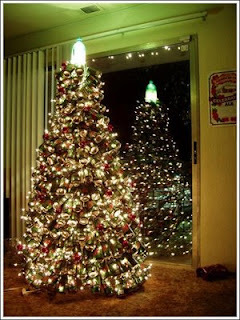 Or, aluminum can Christmas tree! Ack - my grandparents had one of these with the color wheel and all. Love it. And love the photo too!!! Awesome! You would totally own one of those. I alas could never pull it off. The photograph is wonderful! I do hope you use it for Christmas cards. 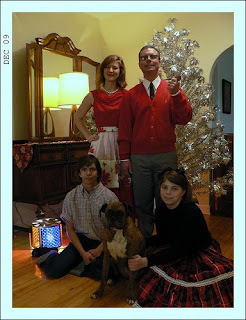 This year we have a black and white version of the 50s photo that will be inserted into an old television screen on the outside of the card and then the color one on the inside. I'm still working out the rest of the details. OMG, we had a rotating light when I was a kid! We got it as a handmedown from my grandmother, who had the most tacky taste ever. My mother hated it; we kids thought it was great. The photo is awesome! Who says greeenies don't have a sense of humor or lack in fun department? I've actually never heard of an aluminum tree before. I've seen silver ones and just thought they were tacky but now I have a new appreciation for what some of them might be. We have a plastic one. I made that decision as an environmentalist a few years ago and now wish I had decided differently. 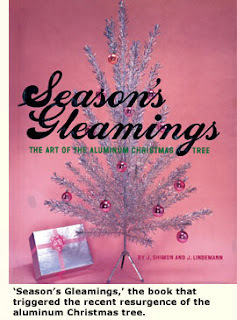 Wow, an aluminum tree, my uncle used to have one of those with the color wheel. My "natural tree cut from the forest a la Chevy Chase parents" found it tacky . . . but now it's retro and green. Nice pictures. Our tree is a six foot metal ornament display tree, a sales fixture from a store going out of business. Re-usable and used, doesn't require watering, and displays all types of interesting ornament variations. We use my grandmother's aluminum tree, it looks just like yours, we even have the old colour wheels, but I am not certain of their safety so we don't use them. Might have to invest in the new LED version though! Love your photo too! I'm glad you found the perfect solution for you & your family, but I had to put in a word in defense of real trees. Here in Oregon, Christmas trees are a crop, just like veggies are a crop. I can't imagine why anyone would have to spray them with pesticides since the most popular varieties around here grow like weeds (literally -- you better not let them get too big in your garden or it will take a chain saw to remove them). In our town, when you are finished with the tree, you call the local scout troop or charity of your choice, attach a bag with a couple bucks to a branch and they come and pick it up. The tree goes to a business that composts it into bark mulch, which they sell back to you next spring. For those who still don't like the "disposable" aspect, you can grow a Christmas tree in a pot and bring it indoors every year until it gets too big and you have to plant it in your garden. I've never understood the preference for an artificial tree. I *love* your tree! Thanks for the fabulous idea! !